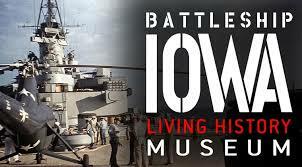 Our overnight on the USS Iowa will take place on Saturday, March 5, 2016. We have 59 people in our group and this is sure to be one of the highlights of the Cub Scout year. Take some time to review the information packet about Camp Battleship here. Please make sure your scout understands the rules and expectations for this trip. Plan to arrive by 4:30 pm on Saturday. The program will end at 9:30 am Sunday. Parking is $12 per car. Scouts should wear their full Class A uniforms and closed toed shoes.